It’s November! Yay! Have you noticed that the stores are playing Christmas music and all the Christmas stuff is out in full force? Whatever happened to Thanksgiving? I love Thanksgiving and refuse to decorate for Christmas until the day AFTER Thanksgiving! Haha! 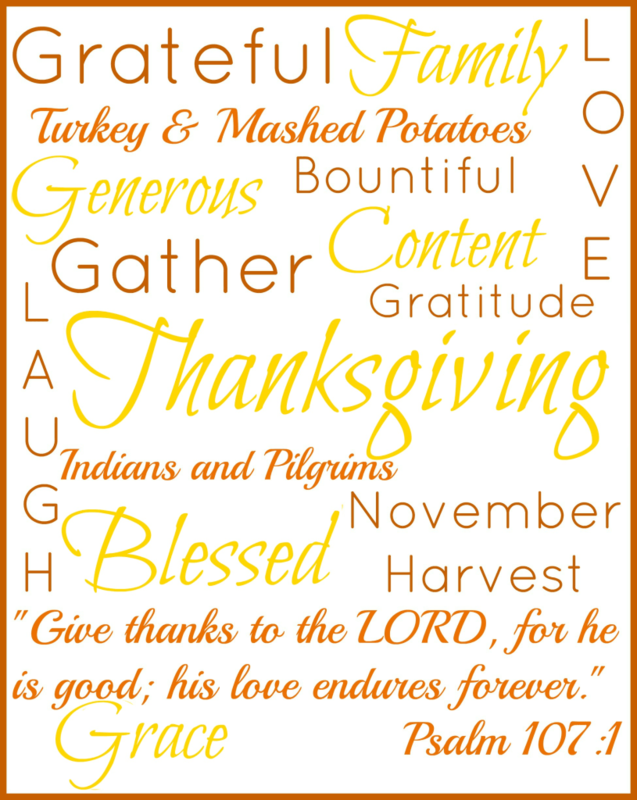 I decided to create printable Thanksgiving subway art to go alongside our turkey couple in our dining room. I really like how it turned out and I especially love the verse. It is just perfect for this holiday! This art prints as an 8 x 10. I hope you enjoy it! Click on the picture to download your FREE printable! Don’t forget to join our Facebook community and subscribe so you never miss a post! Tomorrow I will offer a FREE Thanksgiving meal planner! Stay tuned!